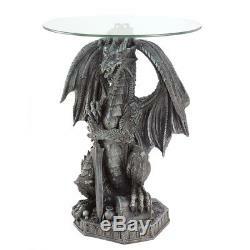 Glass-Topped Fierce Dragon with Sword Sculptural Centerpiece Hand Painted Table. 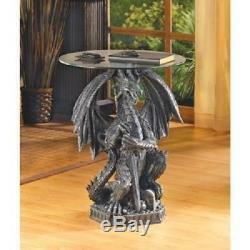 Stunning stone-look statue table features a hissing dragon standing guard over his lord's treasure trove. Styled to resemble centuries-old castle gargoyles, this is a worthy decoration for the chamber of any king! Dimensions: 19" diameter x 23 1/4" high. Looking for more unique gift ideas? Celtic, Gothic, Greek, Roman, Art Deco, & More! Please visit our store for more great products! Feel free to ask any questions. The item "Glass-Topped Fierce Dragon with Sword Sculptural Centerpiece Hand Painted Table" is in sale since Thursday, August 30, 2018. This item is in the category "Collectibles\Fantasy, Mythical & Magic\Dragons\Other Dragon Collectibles". The seller is "stephaney74" and is located in Palm Coast, Florida. This item can be shipped to United States, Canada, United Kingdom, Denmark, Romania, Slovakia, Bulgaria, Czech republic, Finland, Hungary, Latvia, Lithuania, Malta, Estonia, Australia, Greece, Portugal, Cyprus, Slovenia, Japan, China, Sweden, South Korea, Indonesia, Taiwan, South africa, Thailand, Belgium, France, Hong Kong, Ireland, Netherlands, Poland, Spain, Italy, Germany, Austria, Israel, Mexico, New Zealand, Philippines, Singapore, Switzerland, Norway, Saudi arabia, Ukraine, United arab emirates, Qatar, Kuwait, Bahrain, Croatia, Malaysia, Brazil, Chile, Colombia, Costa rica, Dominican republic, Panama, Trinidad and tobago, Guatemala, El salvador, Honduras, Jamaica, Antigua and barbuda, Aruba, Belize, Dominica, Grenada, Saint kitts and nevis, Saint lucia, Montserrat, Turks and caicos islands, Barbados, Bangladesh, Bermuda, Brunei darussalam, Bolivia, Ecuador, Egypt, French guiana, Guernsey, Gibraltar, Guadeloupe, Iceland, Jersey, Jordan, Cambodia, Cayman islands, Liechtenstein, Sri lanka, Luxembourg, Monaco, Macao, Martinique, Maldives, Nicaragua, Oman, Peru, Pakistan, Paraguay, Reunion, Bahamas, Viet nam. Dimensions: 19" diameter x 23 1/4" high.